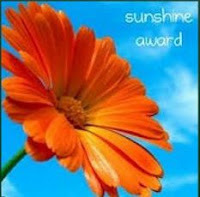 Thanks, Tina Fariss Barbour of Bringing Along OCD, for the Sunshine Blogger Award! Tina writes with tender honesty about her efforts to manage a life overshadowed by OCD, anxiety, and depression. Her posts educate, and her determination and resilience inspire. Tina, you go, girl! You’re awesome! Include the award logo in a post or on your blog (see the flower photo above). Link your nominees to the post and comment on their blogs, letting them know that they have been nominated. What are your favorite things to do? Exploring in nature, gardening, writing, travel, cooking, crafts…I have an endless list! Where would you most like to travel? I’ve been fortunate to travel to many different countries. With my recent move to the Pacific Northwest, I have many travel opportunities right in my own backyard. I am excited about hiking the Olympic Peninsula, Vancouver Island, and other nearby areas. What do you think is the hardest thing to do? Bury a child. I’ve done it and don’t ever want to do it again. What is your favorite non-alcoholic drink? Herbal tea, especially if it’s served in a really pretty teapot. With little sandwiches and chocolates and scones…maybe a little pre-tea champagne…oh, wait, I’m getting off topic. Sounds good, though, doesn’t it? What is your favorite charity? Donorschoose.org. I love supporting teachers and schools. What ambition do you still have? To learn how to treasure every moment. Life is too short to waste time with dramas, whether mine or others’. What is your favorite flower? Purple irises and yellow snapdragons. My nominations (in no particular order): I always enjoy these blogs! There are so many more, but these are faves I haven’t listed in a while or ever. Have a great weekend! Happy Mother’s Day to all you moms! Thanks, Nikky. I appreciate your loyal readership. It means a lot! Wow, thanks, Tina! Big hugs! Yeah, tea pots seem to be a big thing. My sisters came to visit me, and we hit a tea store in Victoria that has an awesome selection of teapots. We went nuts in there! I remember having one of those tiny tea sets when I was a little girl, and it was one of my favorite things to play with. I guess it started there!